Notice: This is an old thread. The last post was 2526 days ago. If your post is not directly related to this discussion please consider making a new thread. by Done, Goody, Evans and Strickland. In this book, Dr. Done and his colleagues at the Royal Veterinary College in London have produced beautiful picture atlas of canine gross anatomy. The book is primarily made up of hundreds of excellent-quality highly detailed photographs depicting dissection of a canine cadaver. Each photograph is accompanied by a brief description of the view and a labeled line drawing identifying structures visible in the photograph. The bulk of the atlas treats canine anatomy by a regional approach, starting with the head and progressing to the pelvis. The first chapter contains a very useful depiction of surface anatomy and its relationship to the boney skeleton (juxtaposition of photographs of a live dog with a skeleton is an outstanding way to teach palpable landmarks); radiographic anatomy accompanies these sections. 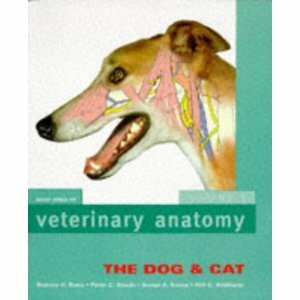 The last chapter addresses feline anatomy in an abbreviated format similar to the canine anatomy. Last edited by Motoko; 20th July 2014 at 07:21 AM. Reason: ADD INFO, IMAGE, DESCRIPTION. TEMPLATE. Last edited by Motoko; 31st August 2017 at 07:25 PM. Reason: UPDATE.